The unexpected on a rainy, boring day. 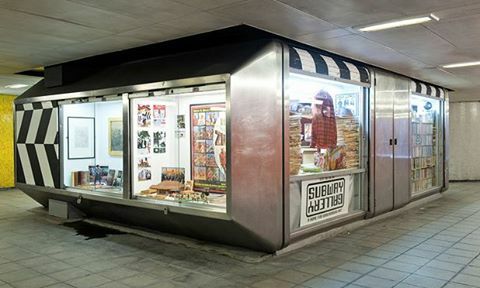 It was mid March, I was going to the Lisson Gallery, close to Edgware Road tube station, when I bumped into a 1960s glass kiosk in the subway that runs below Marylebone flyover. It was hosting pictures all around the four sides, facing the desolated, apparently inhospitable subway. A man in a cowboy hat, from the opposite news-stand, came across as the owner of the small gallery and invited me to get in. A breath of fresh air. He was the Canadian artist, Robert Gordon McHarg III, that opened the Subway Gallery on the 6th of June 2006. He showed me the exhibition, that took both the inside of the cube and the windows that enclose it. I thought I would have liked to know more about this bright idea that has contributed to the enrichment of the vibrant Edgware Road area, noted for its distinct Middle Eastern flavour and mixture of diverse communities. At the beginning of May, the interview. Silvia Meloni: How did you run into this idea? Did you find this kiosk abandoned? Robert Gordon McHarg III: Yes, it has been empty for some years, after being a key-cutter shop, and I decided to take care of it. I thought I had two choices: I could turn it either into a studio space, which could give me, as an artist, a place to work in, or I could think bigger and kind of share it and turn it into a gallery. In eight years we have done roughly eighty exhibitions and if you look at our past history, it is very wide and varied. Galleries are interesting spaces in the sense of getting into them and seeing art from the inside. This gallery, you see it from the outside, so, let’s say, it is like a fish bowl. SM: What is the reaction of the people walking in the subway, that it is by nature quite a sad space? RGM: I have always felt we have such a positive feedback, but also I was thinking how to use the power of art to benefit people. I think if we were not here it would be very sad not to have this energy, because in a sense this is kind of what we are dealing with, it is a sharing exercise. I know we are not a regular gallery in that, because our interest has always been how we can really experiment with the actual space and if we can actually improve the space with art. Every gallery seems to do its job, in a way art is more commercial or let’s say visible, but… we are the underground. RGM: Yeah, and I was thinking that only art could make it a better space, it does not matter how much you try anything else, art is the only thing that kept it going as a space. I also reckon that not even in eight years we got what I could get from the space, we need ongoing improvements. SM: What about the black wall? RGM: The gallery is where we do things officially. Obviously there is always a challenge, but yes, not for every show, but we have used the wall of the subway as an advertising space or for graffiti art, the two kind-of mainstream artforms for the outside, the two main contenders. I have always thought there is a big space between those, that is where I think we can lead towards the future. Both of them are quite established forms of art and I thought there should be something more besides them. That was what we were trying to look at for the black wall, how can you do more. SM: So, apart from photography, which kind of art do you usually exhibit in the gallery? And do you focus on emerging artists or established ones? RGM: We have done a bit of everything, there is no one way. It has always been like a mixture of things, our goal is only to share. I am proud of our past, but I am more excited about the future and that is where our headspaces are right now. SM: I have seen that you shot some video in the gallery, in first instance the music video of ‘The Blinding’ by The Babyshambles. How did it go? RGM: It was funny, Julien Temple (Ed. film, documentary and music-video director) came to see an exhibition at the gallery and said “Oh this would be a great space for a video”. We filmed the band inside and outside the gallery. There was a lot of pressure on that, but I wanted to keep it minimal, we did not tell anyone, I did not like the idea of the press to get in and have extra publicity. They also played around with some artworks, they did a great job. SM: Tell me something about your artwork Him, wax figure of Charles Saatchi, is it placed here for most of the time in the gallery? RGM: Yes, he has been the main invigilator, for years. SM: Is it a mere critique of the art market, or is it something more? RGM: I always say it is like the artist collecting the collector as a joke and then it became something more and more humorous. So it started as a sculpture, then it ended up being a set of cards, then a book. He has been in several shows dressed up differently, it is a fun piece, I am utterly proud. SM: Is it like the only piece Saatchi would never buy? RGM: Well, he saw it and I gave him the first copy of the book and he ordered some other copies afterwards. SM: Is there an exhibition at the Subway Gallery that you loved particularly, a favourite show? RGM: I have loved the journey so far, but I would say that the biggest piece of art was renaming the subway with Joe Strummer’s (Ed. The Clash) name as a tribute for his seventh death anniversary. He was a friend, he lived here and he used the subway. This is my biggest artwork, the whole subway.